With the extended wet weather in late September, growers in many parts of the southeast are dealing with varying degrees of seed quality issues in soybean as they move through harvest. In Tennessee, at greater risk are fields that were mature at the onset of the rainy weather, and received rain in the double digits over several days, although other areas are reporting some seed mold or misshapen seed. Early applications of fungicide (R1-R3) were likely not able to protect from very late-season diseases that set in with the extended cloudy, wet weather. Seed damage includes moldy, discolored and/or shriveled seed and amounts range from a few percent in a truck load up to extensive amounts of damage with loads getting rejected. 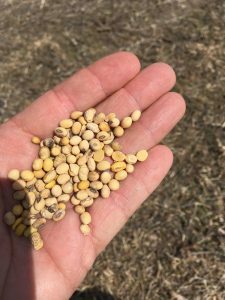 Where damage is limited to portions of a field, it may blend into better seed from the rest of a field during harvest and not impact overall quality. Thankfully, the number of rejected loads appears to be small. There is some variability in dock amounts depending on the elevator, however, loads with even moderate levels of damaged seed (>5%) may be docked more than $1 dollar per bushel due to quality which is a double hit as farmers are already dealing with low seed prices. What should farmers do?? Farmers who are noticing seed quality issues, who have cut a portion of a field and had quality dock at the elevator, or had a load rejected should report the issue to their crop insurance agent ASAP. An adjustor should visit the field in question within 24 hours of filing a claim, determine the extent of the damage, and the steps forward. Rejected loads: Loads may be rejected if damage exceeds 10 to 20% depending on elevator. For farms with extensive seed damage resulting in rejected loads, crop insurance can help farmers with compensation. It is easier to make a loss estimate when some portion of the crop is still standing in the field. If damage is severe and extensive, a farm may be released to destroy rather than harvest an unsaleable product. For farms with lesser amounts of damaged seed resulting in dock at the elevator plus low yields, this situation will likely trigger an insurance claim for loss. For farms with lesser amounts of damaged seed resulting in a dock, but field yields are good, this situation will NOT qualify for a loss claim, although your crop insurance agent should verify this. We are hopeful the harvest quality will improve with drying weather as we work our way into later maturing fields, and that our state misses the rain from the latest system working it’s way up from the gulf.